Everything tastes better when you fry it, right? 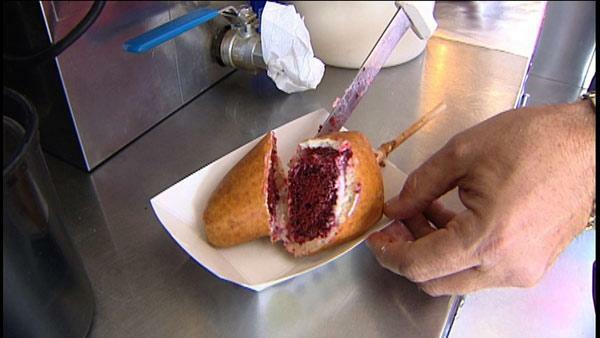 Most carnivals are filled with vendors that serve different foods that are fried on a stick. From friend cookie dough and red velvet cake to chicken fried bacon, some of the most popular fair vendors share their secrets. The key to delicious fried food is the batter. "That is the secret special sauce that we won't tell anybody," said Dominic Palmieri, The Midway Gourmet. David Griffin of Aunt Edmoe's Homemade Cookies has perfected the fried cookie dough on a stick. He won the award for best new flavor for his recipe. Start with frozen cookie dough (any kind). Puts four small balls together and then put a stick through it. Then, dips it in funnel cake batter. You can also use pancake batter. Don't put the batter on too thick. Set the oil to 400 degrees. Leave the cookie dough in the fryer until its golden brown (about three minutes). Add powdered sugar on top. Savory fried foods are just as popular at the fair. Gary Kusak of Yoakum Packing Company says the key to frying anything is hot grease and cold food. His double-smoked, thick-cut fried chicken bacon is very popular. Use double smoked, thick cut bacon. Batter it just like you would chicken fried steak, using flour, egg and milk. Heat peanut oil to 360 degrees. Put in peanut oil until golden brown! 1. Make sure you have a good thermometer that is especially calibrated to know that the grease is the right temperature -- usually around 350 degrees. 2. Your pan should be big enough so that you have room to flip the items so you don't splash oil. For more information visit midwaygourmet.com.